The sixth in the series of York County Hunt for History events will be held Saturday, May 4, from 10 a.m. to 2 p.m. at the Senior Center of York, Washington Square Shopping Center, 5314 George Washington Memorial Highway, in York County. The Hunt for History events are sponsored by the York County Civil War Sesquicentennial Committee and the York County Historical Museum and are free and open to the public. The Hunt for History series will conclude on November 2, 2013, with the final event covering the Bruton, Lightfoot, Camp Peary, Cheatham Annex, Naval Weapons Station, and Lackey areas of the county. 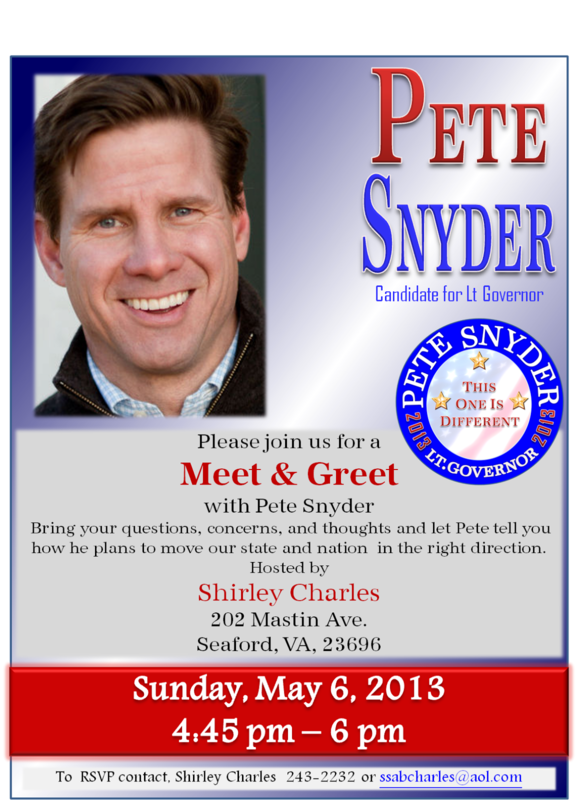 I would personally like to invite you to meet Pete Snyder at my house on May 6 staring at 4:45. I very much hope you come and get to know Pete better. This great opportunity for you to ask him questions and to get to know better. Please let me know if you can come and I will also try to touch base with you by phone later this week. For more information, please see the attached flyer. This week, Newt and Callista will participate in a series of events in South Carolina. On Monday, April 29th, they will be in Greenville for a book signing at Global Trade Park. Newt will then offer remarks at a special Town Hall Forum hosted by Conservative Talk 94.5 and The South Carolina GOP. On Wednesday, May 1st, Newt will offer remarks at the South Carolina Energy & Opportunity Forum in Myrtle Beach. Tim Beale of Dominion Virginia Power recently presented Jim Funk, President of the York County Historical Museum Board, with a check for $1,000 to support the Museum's annual July 4th 8K Run/5K Walk. Dominion has been a supporter of the event since it began in 2010. The 8K/5K is the largest fundraiser of the year for the Museum, drawing runners and walkers from all over the region. In 2012, 496 individuals participated in the 8K Run and 98 took part in the 5K. The event is held on the tour roads of the Yorktown Battlefield with the cooperation of the National Park Service. This year's 4th annual event will begin at 8 a.m., on Thursday, July 4. Registration and parking begins at 6:30 a.m. at York High School, 9300 George Washington Memorial Highway (US-17), in York County. The Board of Supervisors has decided that, depending on the progress made during the remaining scheduled work sessions, it may adopt the tax rates for Calendar Year 2013 and approve the Fiscal Year 2014 Budget at the conclusion of the May 2, 2013 work session. If the Board is unable to complete its budget deliberations on May 2, it will plan to act on the tax rates and budget on May 7, as originally scheduled. The change in schedule is due to a number of scheduling conflicts and will provide the Commissioner of Revenue and the Treasurer with additional time to process and mail the tax bills for the June 25 payment date. Statistics show that at least 8 out of 10 child safety seats are installed in a way that could compromise the safety of the child in the event of a crash. Residents are encouraged to participate in our child safety seat check-up events at no cost (except for a bit of your time) as part of a public outreach initiative by the York County Department of Fire & Life Safety to keep citizens and their children as safe and protected as possible in the event of a crash. If possible, please bring your vehicle and safety seat manuals with you to the safety seat check. Also, it is best if you bring the child along to assist with ensuring the proper adjustments are made to the child restraint for proper fit. After completing a brief form, a technician will review the installation of the seat, how well the child is secured in the seat, and check for any recalls that apply to the safety seat. The technician will then help parents correct any errors and will answer any other questions about child passenger safety. Proper safety seat installation takes approximately 20 minutes per safety seat. If you cannot attend one of these events, call the Department of Fire & Life Safety at 890-3600, Monday through Friday from 8:15 a.m. until 5:00 p.m. to schedule an appointment. It is advised to have only certified technicians (CPST) check your child's safety seat for proper installation and recalls. Calling ahead will allow our staff to connect you with a certified technician for assistance. Fellow Hobbyists. If you missed this event you missed a really good time – Nice cars, plus great food and entertainment. Be on the lookout, Clarence tells me that they're planning a repeat on May 21st – We'll make sure that the word gets out. Clarence: Please thank your Pastor, musicians and all of the volunteers that helped make this such a wonderful event!!!! Fellow Hobbyists: Here's a great opportunity forwarded for your consideration. Lest there be any confusion – Modified cars are welcome and even encouraged – I intend to bring the Merc..
A variety of educational and entertaining programs is being offered at the Senior Center of York in May. Participation is open to seniors age 55 or better and their spouses, regardless of age. The Center is located in the Washington Square Shopping Center at 5314 George Washington Memorial Highway (Rte. 17), and is open Monday through Friday from 9 a.m. to 4:30 p.m. The Center is closed all county holidays. Reservations are required for all sessions and are accepted on a first-come, first-served basis. To register, stop by the Center or call 898-3807. For more information, please visit www.yorkcounty.gov/communityservices. Scrapbooking & Greeting Cards, Monday, May 13 from 9 a.m. to 12 noon. Join us as Cathy Fowler of Creative Memories demonstrates how to make beautiful cards and assists you with your scrapbook. These cards and your personalized scrapbook create lasting memories and make wonderful gifts for loved ones. Note: Please limit to four cards. For more information and to register please call 898-3807. "You Fill in the Blank," Tuesday, May 14 at 1 p.m. Come have some fun with this word game based on the television game show, The Match Game. The show was most popular in 1973 and was hosted by Gene Rayburn. In this game show, a panel of celebrities received questions and responded with partial answers. Contestants then tried to complete their answers by filling in the blanks. In our version, we will see if our contestants can match each others' answers. Trivia and prizes. Please register by May 13 and please indicate if you would like to be a contestant. Picnic in the Park, Friday, May 17 from 11 a.m. to 1:30 p.m. at the Yorktown Beach Picnic Area. Join us for an exciting time with food and games at the Yorktown waterfront. The menu will include hamburgers, hot dogs, fried fish, potato salad, baked beans, cole slaw and beverages. Suggested donation is $3.50 and payable at the time of registration at the Senior Center. Registration will conclude on May 14 or until space is full. BrightStar Care of Williamsburg will assist with games and prizes. Please be sure to check our hotline number at 890-3516 on the day of the event should there be inclement weather. AARP Driver Safety Program, Monday, May 20 & Tuesday, May 21. This program is designed for drivers age 50 or better, and will take place on Monday, May 20 from 12:30 to 4:45 p.m. and Tuesday, May 21 from 12:30 to 4:30 p.m. The cost for this two-day program is $12 for members of AARP and $14 for non-members.Fees should be paid by check and made out to AARP. Class registration may be made in person at the Senior Center, by phone, or by mail. Note: AARP membership, which cannot be processed the day of a class, is not required for class registration. There is no "behind the wheel" driving performed in this program. Drivers age 55 or better must attend both classes to receive the state mandated three-year automobile insurance reduction. Many insurance companies are giving insurance reductions to drivers age 50+ with the same attendance requirements. Those less than age 55 should check with their insurance company to see if they are entitled to the three-year insurance reduction. Class enrollment is limited to 25. Culture Day Veteran's Panel, Wednesday, May 22 at 1 p.m. In honor of Armed Forces Day, there will be an informal patron panel discussion of those who served in the U.S. military to share stories and to talk about the good and challenging experiences faced while in service. All of us have benefitted from the dedication and sacrifice of our uniformed men and women (and their families), but many of us know very little of what life was actually like in the military. If you are interested in being a part of the panel please let us know, and also feel free to bring in any pictures or memorabilia to show the group. This should be a very interesting event. May Birthday Bash Karaoke, Friday, May 31 at 1 p.m. Karaoke Jockeys Sam and Dave are back with their fantastic selection of songs, so come sing along! You are sure to find something to suit your musical tastes. Individual and group performances are encouraged! Remember you do not have to be celebrating a birthday to come celebrate with us. Cake and beverage served. Please register for this program by calling 898-3807. Newt and Callista will visit Greenville, SC and Myrtle Beach, SC during the last week of April. In Greenville, Newt and Callista will host a book signing at Global Trade Park on April 29th. Newt will then offer remarks at a special Town Hall Forum hosted by Conservative Talk 94.5 and The South Carolina GOP. In Myrtle Beach, Newt will offer remarks at the South Carolina Energy & Opportunity Forum on May 1st. On Wednesday, April 17th, Newt and Callista attended the funeral for former British Prime Minister Margaret Thatcher at St. Paul's Cathedral in London. In this week's newsletter, Newt highlights the remarkable leadership and achievements of Baroness Thatcher and says that she has left behind a truly incomparable legacy. The York County Board of Supervisors recognized outstanding county government volunteers at its meeting Tuesday night. These volunteers were recognized for the many hours they have donated to helping various county departments, from the local Cooperative Extension Office to New Quarter Park and the Senior Center of York. In all, the county benefitted from the help of 2,061 volunteers and 88 groups in calendar year 2012, who contributed an estimated 59,995 hours of volunteer service. The value of those volunteer hours added to the generous contribution of $172,494 in monetary and in-kind donations the county received equals approximately $1,500,783 donated to county government operations in 2012. The county's 2012 Outstanding Volunteers are: Senior Center of York Volunteer Myrna Graham, Tall Ships Committee Volunteer James Parry, Virginia Cooperative Extension Master Gardener Jan Wiener, Head Start Program Volunteer Morris Randall, Historical Committee Volunteer Lois Winter, Virginia Master Naturalists Jan Lockwood, Lois Ullman, Joyce Lowry and Jeanette Navia, and Head Start Program Supporters Crystal Breede and Jerry Kenney (representing the Mariners' Museum), and Antoinette Lansdell, Mosquito Monitor Volunteer. The York County Planning Commission will hold a work session at 7:00 p.m. on Wednesday, April 24 for the purpose of discussing the draft update of the Comprehensive Plan titled Charting the Course to 2035: The County of York Comprehensive Plan. The work session will take place in the York Hall East Room, located at 301 Main Street, Yorktown. The Comprehensive Plan is the long-range plan for the physical development of the county, and Section 15.2-2230 of the Code of Virginia requires that it be reviewed at least once every five years. A five-year update of the Plan has been prepared and is currently under review by the Planning Commission. The draft Plan can be downloaded from the York County Planning Division web site at www.yorkcounty.gov/planning. Grab your work gloves and get ready York County! Through a partnership of askHRgreen.org and Keep Virginia Beautiful, York County will join other localities for the national clean-up day on Friday, April 26 and Saturday, April 27 from 9 a.m. to noon. This clean-up day is the largest grassroots community involvement program in the United States. To join the effort, contact Molly Nealer, York County Parks and Recreation Supervisor, at nealerm@yorkcounty.gov or Laurie Halperin, York County Recycling and Beautification Coordinator, at halperil@yorkcounty.gov, or call 890-3513. The Board of Supervisors is seeking applications from county citizens interested in serving on the York County Planning Commission to fill upcoming vacancies for Districts 1 and 2. The Planning Commission serves as an advisory body to the Board on land use and development issues, carries out the duties and responsibilities set forth in the state enabling legislation and the County Code, and facilitates community participation and public interest in planning for York County. The Commission is responsible for reviewing and making recommendations on applications for rezoning, Special Use Permits, Zoning and Subdivision Ordinance text amendments, and other development approvals that require action by the Board of Supervisors. In addition, the Commission is responsible for reviewing and making recommendations to the Board of Supervisors on the county's Comprehensive Plan. The Planning Commission is made up of seven members, including one from each election district and two who serve the county at-large. The length of term for appointees is four years. The Commission meets the second Wednesday of every month at 7 p.m. in Yorktown. Meetings are televised on the York County Cable Channel. York County citizens interested in applying for future appointment to the Planning Commission can obtain and file an application by using the County web site. Visit www.yorkcounty.gov, click on On-Line Services, and then select Board Bank Application. Applications can also be obtained at the County Administrator's Office at 224 Ballard Street in Yorktown or by calling 890-3320. For more information on the Planning Commission, please visit www.yorkcounty.gov/planning or call the York County Planning Division at 890-3404. Your York County Pre-File Delegate forms have been reviewed by the York County Registrar to certify that you are registered voters in York County. Congratulations on being elected a York County Delegate to the RPV State Convention 17-18 May 2013! There are 102 certified and elected York County Delegates. The finalized list of certified York County Delegates was submitted to the Republican Party of Virginia by our deadline: Thursday, 11 April 2013. You should begin receiving information from RPV regarding convention information as well as from the candidates. The RPV website has more detailed information about the convention: www.rpv.org . Click on the “RPV Convention” bar on the left side of the main page to find links to information on the events, hotels, candidates, and other details. I look forward to seeing you all in May! On Monday the world lost a truly remarkable leader. In this week's newsletter, Newt reflects on the impact that former British Prime Minister Margaret Thatcher had on the world, saying that every citizen can learn from her condemnation of socialism and her critique of big government. He also encouraged all political leaders to learn from her courage and strength. In recognition of National Autism Awareness Month, the Gingrich Foundation is pleased to announce the Autism Society is the April Charity of the Month. Since its founding in 1965, the Autism Society has worked to increase awareness and provide resources about the disorder, as well as promote the dignity of all individuals on the spectrum. Mitch Daniels and "The Party of Hope"
In a new interview released by Newt University, in conjunction with the Republican Governors Public Policy Committee, Newt interviews former Indiana Governor Mitch Daniels about his achievements as governor. During the interview, Daniels shares how he was able reform and modernize Indiana during his eight years in office, and what we can do to create a better America for all. Newt's Newsletter: Mitch Daniels and "The Party of Hope"
Article: Does Downton Abbey's Next Emmy Campaign Begin or End with This Second Endorsement from Newt Gingrich? There was an error in the latest press release. The correct date of the DMV2Go visit to the Yorktown Library is April 23. The body of the release listed an incorrect date of April 16.